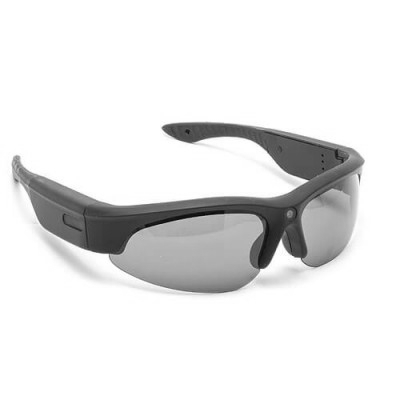 Real hidden camera waterproof compact autonomous with its long battery-operated recorder integrated with motion sensor for high-resolution 5-megapixel CMOS for a good photo or video. 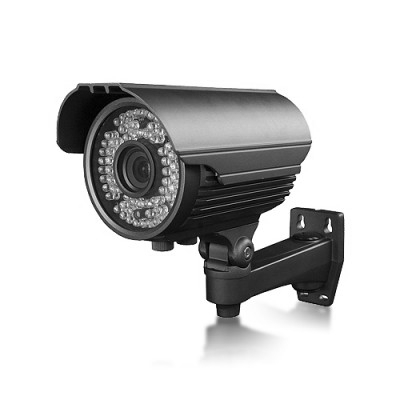 Our hidden camera is equipped with autonomous infrared system with a range of 20 meters, 2 type of resolution in photo mode 3 million pixels for a score of 2048 X 1536 pixels or 5 megapixels gives you a maximum resolution of 2560 X 1920 pixels. 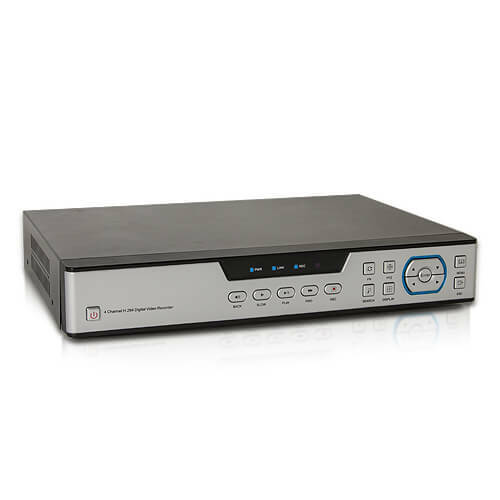 Video Mode VGA two-mode 1) a resolution of 640 x 480 at 20 frames per second or 2) a resolution of 320 x 240 at 20 frames per second can be set in the very simple menu of the camera hidden. 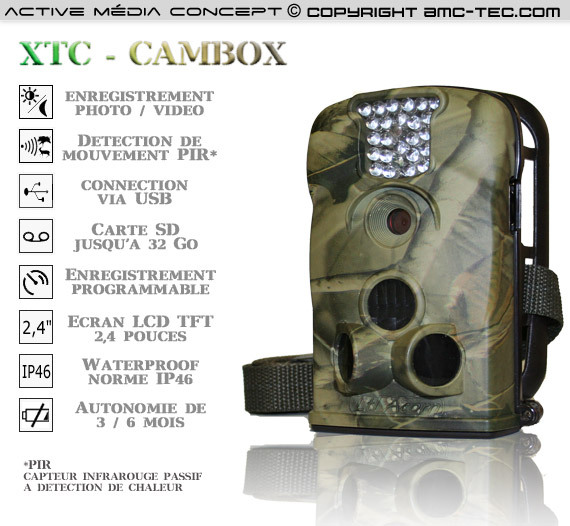 Our camera easily concealable with a type of camouflage its appearance has a battery life of 6 Months in stand-by without detection with the external extension provided automatically or in 3 Months with no extension. 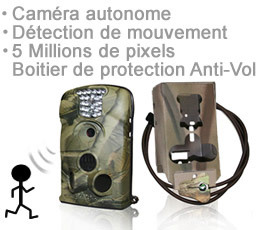 The camouflage camera is equipped with three motion detectors with an ultra fast viewing angle of 100 Degrees per detector, detection of an event you can get is a recording mode picture taking picture of 1 to 3 in detection or management mode Video recording as that there is an animation before the camera camouflage. 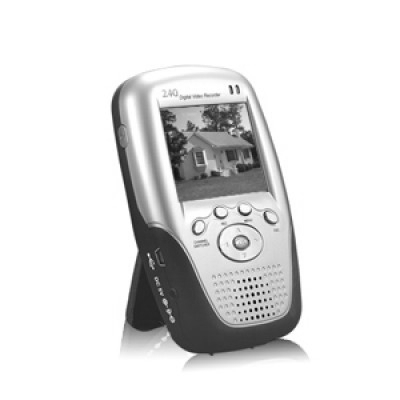 Our very discreet camera with its khaki-type coating can be programmed for a photo or video taken daily to monitor whether a building or animal tracking a construction site (house, construction) or otherwise. The registration system of our hidden camera is SDHC card up to 32 GB (SD card not included), an overlay of the date and time are on each event as well as video camera mode. Our waterproof camera is hidden under the IP54 so resistant to moisture and splash water, camera disguised as foliage is protected by a password of 4 numbers to access the menu and are protected by cover may be lock system. 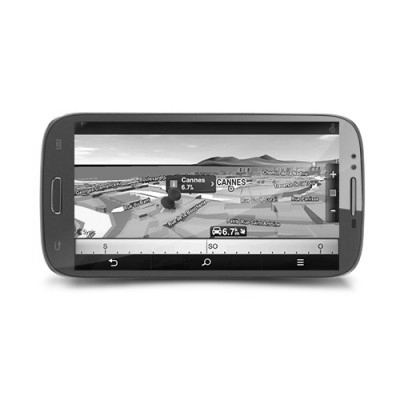 Access to the menu is perfectly clear with its setup screen and player has 2.4 inch TFT LCD, without forgetting the accessory strap for (tree, pole, support etc.). 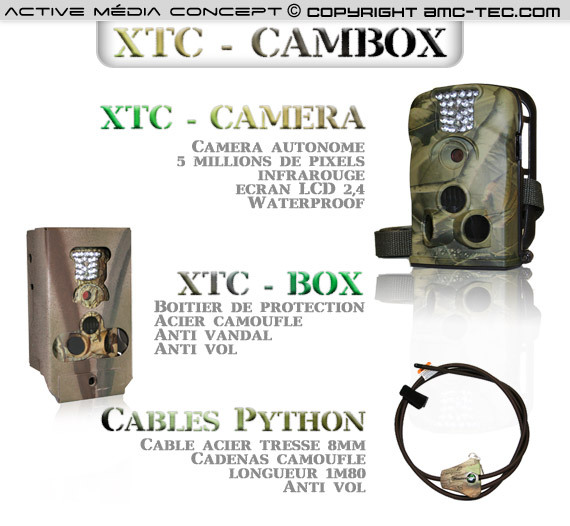 The protective case included in this pack has been designed specifically for camera-XTC CAMERA for easy installation, it can be closed with a cable type Python braided steel 8 mm in diameter, secured by a padlock security. 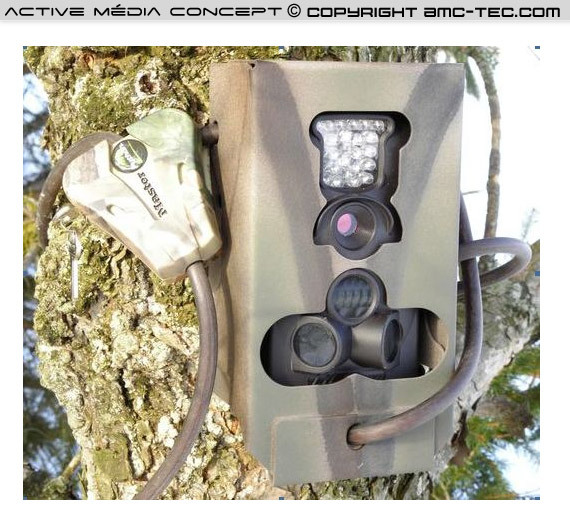 Ideal for monitoring your territory, observing wildlife, poachers or identify intruders, here is a cover-up camera / video camera triggered by PIR motion detector and a compact and efficient excellent price / quality ratio. 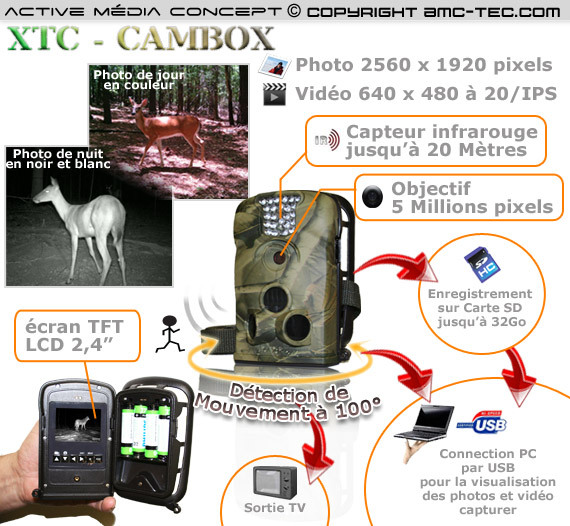 The combination of XTC-CAMERA and its protective box will allow you to fight against theft. 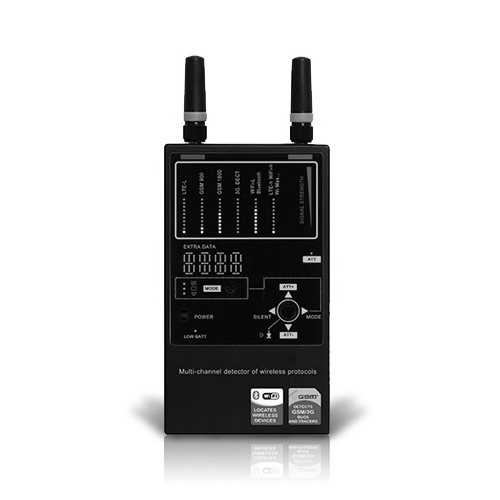 For effective video surveillance in certain sensitive areas of type: Workshop, warehouse, shed, field, property, but also for hunters.